Generator Rental | FroggyHops.com Minneapolis MN. Need electricity? 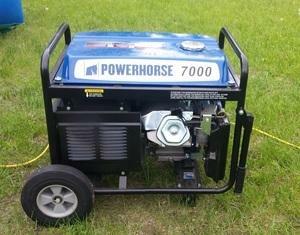 Power up to three inflatables with ease with this 7,000 Watt Powerhorse Generator. The rental of a generator will be delivered with a full tank of gas that lasts 3-5 hours based on the load. The cost of gas is not included in your rental. Note that generators are only required when a standard electrical outlet is not available.